watertight joint between the bases. In most cases, the base also supports the drive train. The gear boxes that drive the stands are very seldom mounted on a separate base. Standard mill base design does not exist, but most beds are similarly constructed either from plates or from tubular sections. The upper surface of the top plate is either fully machined or is machined only along the longitudinal edges where the stands and gear boxes are mounted. An alignment keyway is machined in the full length of the top plate. The keyway (or other components) should be straight within 0.025 to 0.050 mm along the full length of the mill even if it is assembled from sections. Holes are drilled and threaded for mounting the stands and other components. The upper edges of the base sides are welded to the top plate, and the lower edges are attached to a frame structure. Leveling and foundation plates are attached to the frame. Cross plates and other members welded into the cavity of the base provide additional rigidity and support. To provide a return flow to the lubricant, most mills have a channel around their top perimeter. Frequently, the channels are made from structural angles welded to the bed with a sufficient gap for the lubricant and access for cleaning. It is useful if the bottom of the channel is slanted towards the liquid discharge opening. During construction, the top of the outside vertical leg of the angle should be above the Mill Base. The protruding leg machined to level with the Mill Base provides an additional support to the outboard stands during tool change and installation. should be rechecked. The cutout may have to be reinforced. In mills traveling sideways on rails, proper support should be provided for the casters (or slides) and the forces exerted during the sideways movement should be checked. In most cases, the height of the mill base is calculated to provide comfortable pass line height for the product. Usually, the pass line height is set at 900 to 1025 mm above the floor. However, the size of the stands, the type of presses, other secondary operations in the line, and the method of material handling may determine the actual pass line height. If the pass line height is too high, then a walking/working platform must be provided along the operator side of the mill. However, safety and fatigue (the frequency the operator must step on and off the platform) are additional factors to be considered. Therefore, occasionally, the cutoff press or other equipment is installed in a pit to create a comfortable pass line height for the operators. 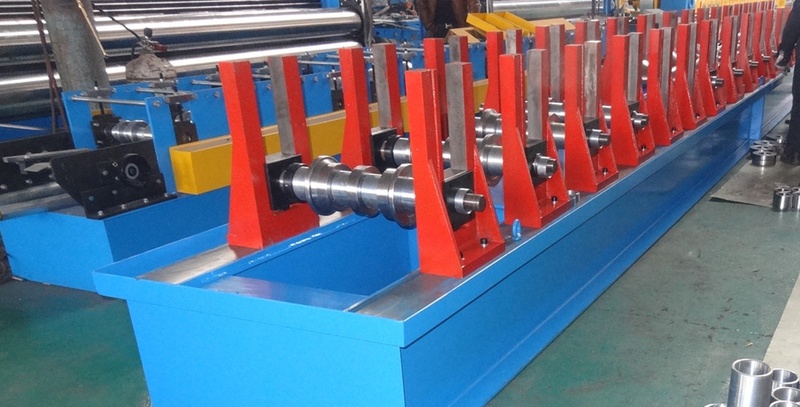 Believe Industry Company is engaged in design and manufacturer Custom Roll Forming Machine as desired drawings.